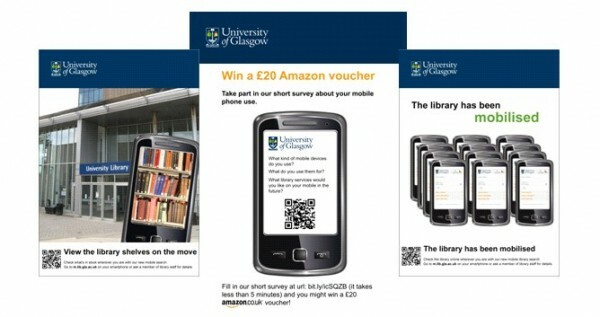 This case study outlines the process of development and implementation of a mobile strategy at the University of Glasgow Library. In December 2010 a comprehensive Library strategy for mobile service delivery was endorsed by the Library’s Senior Management Team. The main goal of the strategy is to transform access to information in innovative ways that will engage and empower our users through the powerful features that modern mobile devices offer. However, as planning for the implementation of the mobile search service began in October 2010, data from Google Analytics indicated that the numbers of users accessing the website and search services on mobiles was increasing even more dramatically than we could have predicted only a few months earlier. It was clear that we needed to think more widely and imaginatively about mobile Library services, identifying areas where we could use mobile technology to provide not only new services, but to enhance or expand existing ones. A decision was made to take a more strategic approach to the implementation of mobile services than had been explored in our initial paper. As a starting point, the Mobile Technologies Group looked for evidence of good practice in strategy development. The JISC Strategy infoKit sets out what are believed to be ‘the most important tasks and processes required to successfully articulate, coordinate and manage strategic activity’ and defines certain key stages in strategy development and implementation. We identified eight key stages in our strategic planning: to evaluate and monitor developments in mobile technology; to evaluate user requirements; to form and define our objectives; to formulate a strategy; to identify the resources required; to gain approval from senior management; to consult and obtain buy-in from other library groups; and to manage implementation effectively. A vital element identified in the infoKit is that those responsible for the strategic planning and activity have ‘all relevant facts at their disposal’. A systematic review of the academic literature was undertaken and a decision was made to survey our own users and ask them what Library services they would like to be able to access on their mobile devices. Engagement with colleagues in other departments within the University who were also developing mobile services was also explored. development of the Live Lab concept for device/service testing and staff training. Our comprehensive Library mobile strategy, which included a full literature review and a ten-strand project plan with a phased implementation schedule and future service development opportunities, was endorsed by the Library’s Senior Management Team in December 2010. The strategy not only provides the framework for the development of mobile services, but also for the management of the project as a whole. Specific priorities for each phase of implementation, across the different target areas, are developed by the Mobile Technologies Group, and then assigned to working groups to be delivered by a specified date. Where possible, responsibility for target remits are given to existing groups already working on service enhancement and delivery in related areas. The Mobile Technologies Group maintains over-all responsibility for the management of the project as a whole, as well as responsibilities for the continuing development of the Mobile Website and Live Lab concept. See Fig. 1. Phase 1 of the strategy, which ran between January and June 2011 concluded with the successful launch of a number of new services including the mobile Quicksearch service, the meebo instant messaging enquiry service, and various QR code initiatives in July 2011. Phase 1 priorities across all ten target areas had all been relatively modest because of the time frame established for delivery. On completion of Phase 1, each of the Working Groups were submitted a full report to the Mobile Technologies Group which then compiled a synthesis report Based on the findings and recommendations of each of the individual working groups, planning for Phase 2 began in Autumn 2011 and a report with the recommendations of the Mobile Technologies Group for the development and implementation of Phase 2 was endorsed in November 2011. Remits for Phase 2 are more ambitious, more focused and the considerable overlap between groups that became apparent during Phase 1 have been taken into account. As a result, the implementation period for Phase 2 was extended to the whole academic year, with a delivery target of June 30th 2012. Engagement with Library staff and other colleagues at the University of Glasgow and the wider Library community in Scotland is the most significant addition to the strategy in Phase 2. For example, membership of one of our key working groups has been extended to include a colleague from the University IT Services Networking Team, looking at WiFi, 3G and Bluetooth provision in the Library building. Engagement with the wider Library community in Scotland has also been actively pursued in Phase 2. We have established relationships with HE, FE, specialist and public libraries and engagement has taken the form of publications, presentations, co-operation agreements and visits to our Library Live Lab. Initial engagement with Library staff took the form of drop-in sessions to launch the strategy and the Library Live Lab concept. The Live Lab offers library staff the opportunity to experience an extensive range of mobile devices (phones, tablets and readers) across the most popular mobile operating platforms. Devices can be borrowed for use at home or used within a dedicated physical space which has excellent WiFi and 3G coverage. This facility provides a relaxed environment with easy access to devices and support in which mobile services can be explored, developed and tested in highly collaborative and innovative ways. For example, we have tested the functionality of our e-book collections on a variety of mobile devices and operating systems, and this project is now being expanded to include all electronic resources, such as databases, e-journals and websites. The drop-in sessions, which were particularly well attended, showed that there was a real sense of enthusiasm for these developments among the staff. At these sessions, Library staff were asked to vote on a number of ideas for a poster marketing campaign, all of which were designed by a library staff member, and the most popular were selected (Fig., 2). Another, somewhat, unanticipated outcome, was that some members of staff began to explore how mobile devices might be used to improve working practices in their own departments. However, it was also evident that familiarity with modern mobile devices was not widespread, and as a result, the Phase 2 target for the Digital Media Skills Working Group is to develop a digital media skills training package for Library staff. 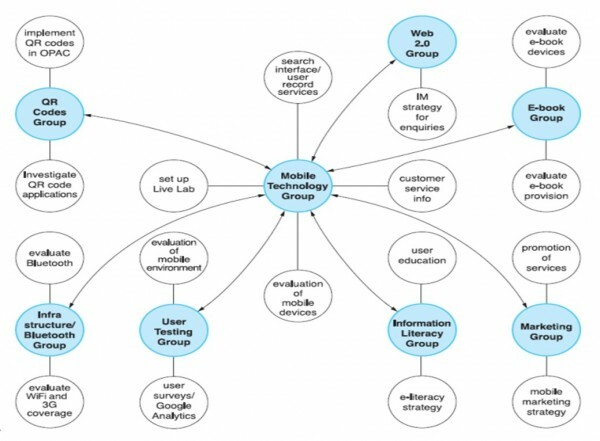 The Mobile Technologies Group and its Working Groups regularly monitor the literature being published in this area in order to prepare for new developments. Library services and practices are reviewed as new innovations are introduced and as user expectations grow. We are confident that our strategy is dynamic and flexible enough to allow for constant review and change. All of the Working Groups are encouraged to make recommendations for change or adaptation both during the current phase or for a future phase. This approach allows for a wider input to the development process, but more importantly ensures that the strategy is not rigid, that our targets are constantly evaluated and that discussion for future developments become part of the strategy itself. Ensure that your strategic framework is flexible and adaptable in this rapidly changing environment – don’t be afraid to make changes! what they want to be able access from the Library via their devices.